The first time I found a Louse Fly, around a year ago, I remember thinking it was a Tachinid and then having no luck I think I finally stumbled across the Rhinophoridae key that is an appendix to Steven Falk's draft key to Calliphoridae. 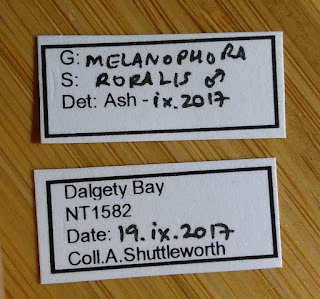 Yesterday I managed to complete my set of Fife Rhinophoridae with Melanophora roralis. This was my third species this year. Considering the county list at the start of the year was 2 species that's not bad going! This is the blackest of black flies. Its wings are black. Even its calypters are black. And its halteres. Remarkable. 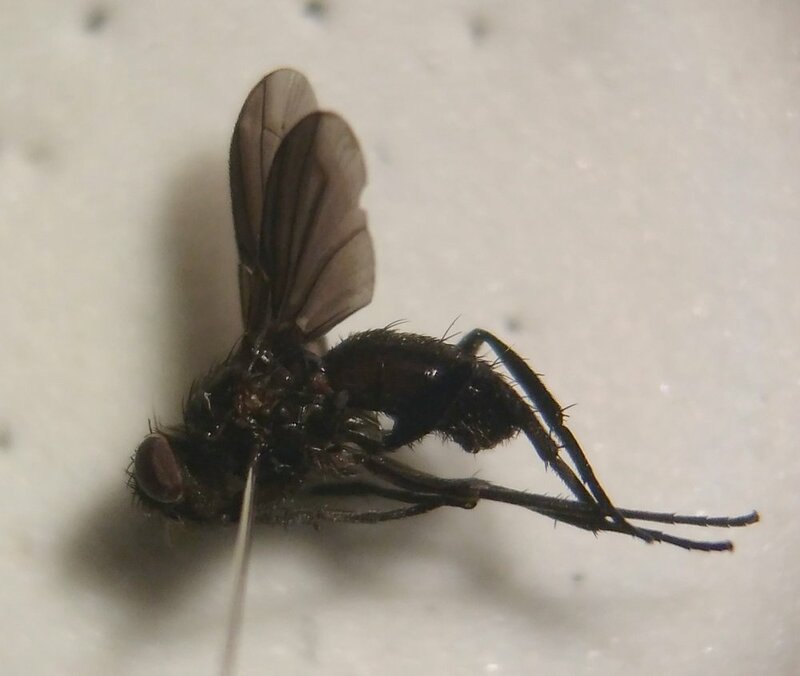 At first when I swept and potted it I expected to just confirm it was Melanomya nana, which is a pretty common fly here (Little Black Blowfly or something like that), so when I popped it out under the microscope last night I was well pleased! Actually I lied a bit earlier. Since this species was only known from the Isle of May it means there was only one mainland rhinophorid species at the start of the year. NBN shows only 10 records for the family in Scotland, which probably shows a remarkable dearth of dipterist activity as much as anything else. 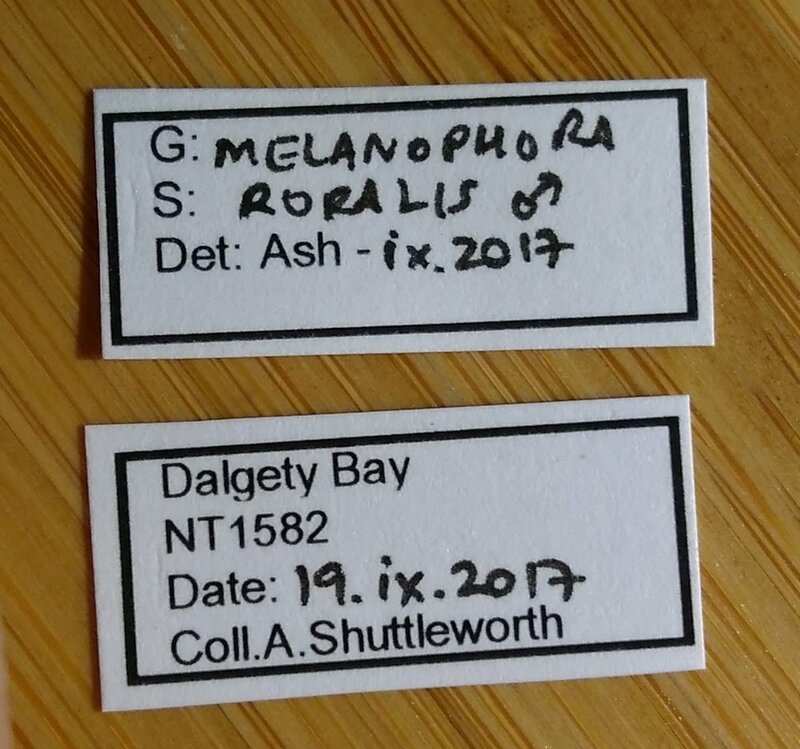 I also see that NBN has zero records for Rhinophora lepida for Scotland, which maybe I ought to have checked out earlier (did i and I forgot? Maybe). In fact it has apparently a very southerly distribution, though I have two vouchers of it from the square this year! Anyway, here's the black fly, my only ID success of last night but I can live with that!